We step up the level of saving opportunities for you!! 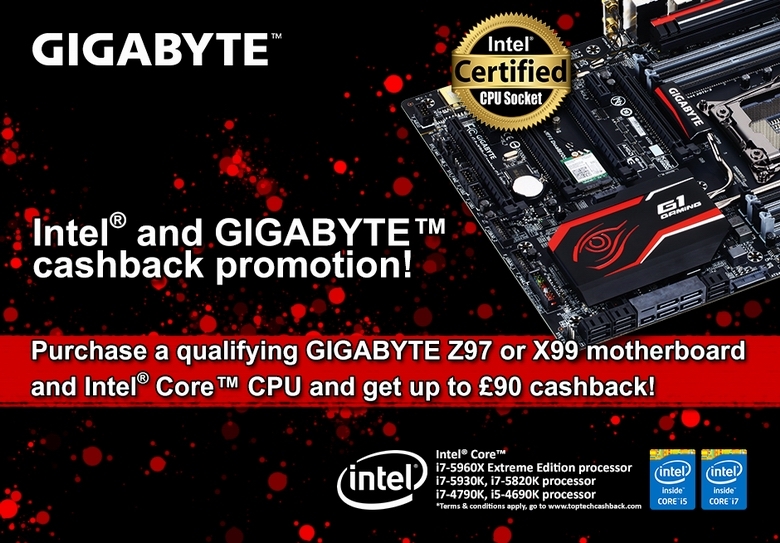 Additional to our currently running Black Edition Promotion “Take one, Get 2”, in cooperation with Intel, GIGABYTE proudly presents the new cashback promotion for all Z97 and X99 motherboards. Claim up to £90 cashback here. Anything for us in the USA?? 2.The Promotion is open to residents of Norway. Only purchases of Qualifying Products made in the Territory are eligible to enter the Promotion. Qualifying Products must be purchased in the same place and on the same date This offer is not open to employees of Intel and other manufacturers whose products included into promotion, their parent companies, affiliates, subsidiaries, advertising representatives and agencies, their agents, wholesalers, resellers, retail staff, retailers, participating stockists or anyone connected with the Promotion and the immediate families of any of the foregoing persons, are NOT ELIGIBLE for this Promotion. I thought I might have qualified buying my mobo and cpu on the 15/10/2014. No, sorry. It's for the participating countries from Europe listed here. You may check with our and/or Intel US branches for local programmes there. P.S. T&C's have been corrected to list the proper country, thanks for notice.